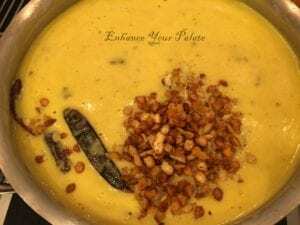 Mangodi Papad Kadhi is another authentic rajasthani kadi recipe, commonly served as an accompaniment with some staple foods such as finger millet, rice or Indian flat breads. This authentic recipe has been further enhanced here by addition of green mango, which has high levels of antioxidants and vitamin C. These antioxidant properties protect the body against cancer and cardiovascular diseases. 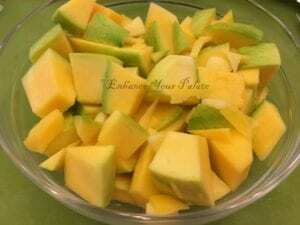 Additionally raw green mangoes also help in weight loss, treating indigestion/constipation and prevent dehydration. Green mangoes increase the secretion of bile acids and clean the intestines of bacterial infections that helps in treating liver disorders. Further the main ingredient of Khadi is chickpeas flour which makes it protein rich, but addition of sun-dried mung lentil nuggets (mangodi) and lentil pappudum makes it even more richer in protein. 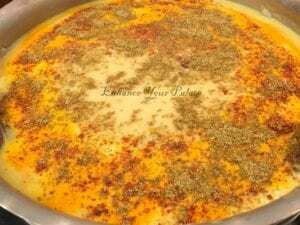 Hence, overall if you are able to incorporate this enhanced authentic khadi version in your meal plan, than it will provide your family far reaching health benefits. 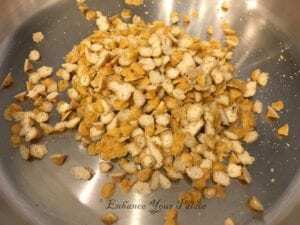 Above ingredient quantity will yield 4 to 6 servings. Peal and chop the green mango. Boil it with 1 cup of green water using any kind of pressure cooker. You can do it in a pan also, but it take longer and more water. Unfortunately my green mango did not turn out to be that green from inside. I used electric pressure cooker for three minutes in manual mode to boil. 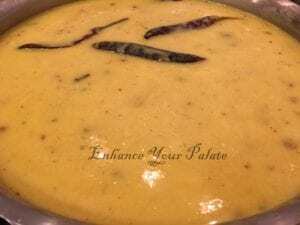 Once the boiled mango cools down, make puree using blender. Meanwhile, take a deep pan in which you are planning to make khadi. Add 1 tsp of oil and roast sun-dried mung lentil nuggets (mangodi) in that until golden brown. Take it out and keep them aside. Mix chickpea flour in buttermilk with whisker in a mixing bowl. You may use blender as well to helps in removing lumps. In same pan, which was used to roast mangodi, heat 1 tbs oil and add asafoetida, cumin seeds, fenugreek seeds and whole dried red chilies. When seeds start splattering, add green chilies and ginger. Roast them for few minutes and then add mixture of buttermilk and chickpeas flour. Add additional 2 cups of water and keep stirring the mixture until it starts to simmer. Now add mango pulp to the mixture. Again continue cooking till it starts to simmer. 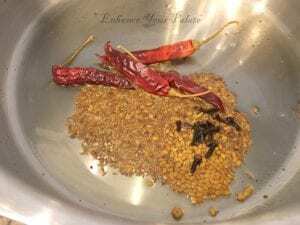 Next add all the dry spices (turmeric powder, red chilly poweder, coriander powder and salt). 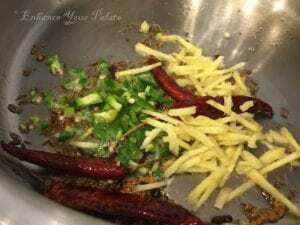 Give it a good mix and continue cooking. Add roasted mangodi and pappudum to the mixture. Let the mixture simmer for additional 25 to 30 minutes on low heat. If you feel that it is getting too thick, then add a little more water. 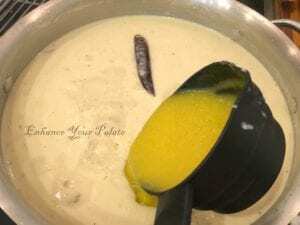 If you want to enhance it further, you can add tempering (tadka) from the top. Avoid to keep it low fat. Your Mangodi Papad Kadhi enhanced with green mango falvor is ready. 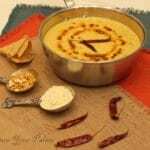 Serve as an accompaniment with some staple foods such as finger millet, rice or Indian flat breads. If you’d like, you can have it just as a soup as well. 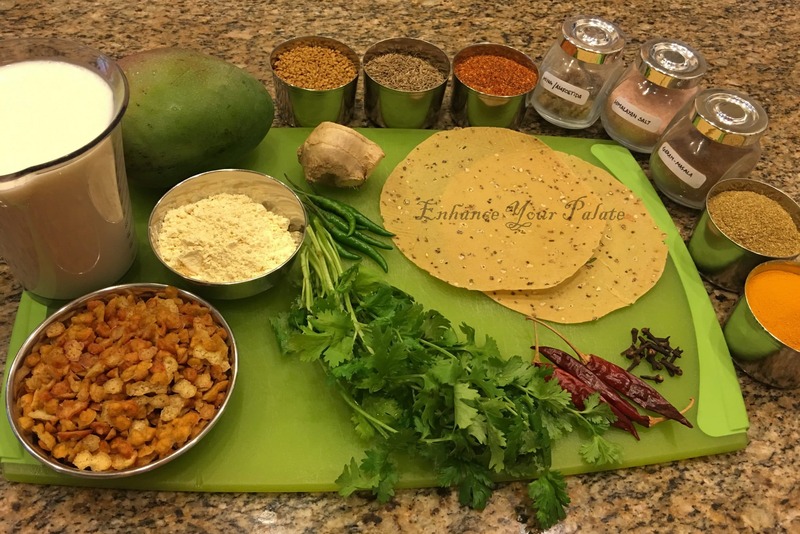 Authentic Rajasthani Mangodi Papad Kadhi enhanced here by addition of green mango, which has high levels of antioxidants and vitamin C. Further the main ingredient of Khadi is chickpeas flour which makes it protein rich, but addition of sun-dried mung lentil nuggets (mangodi) and lentil pappudum makes it even more richer in protein. Hence, overall if you are able to incorporate this enhanced authentic khadi version in your meal plan, than it will provide your family far reaching health benefits. Peal and chop the green mango. Boil it with 1 cup of green water using any kind of pressure cooker. You can do it in a pan also, but it take longer and more water. Unfortunately my green mango did not turn out to be that green from inside. 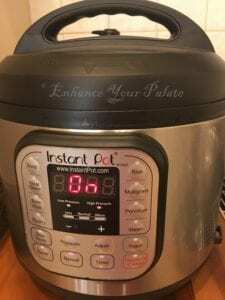 I used electric pressure cooker for three minutes in manual mode to boil. 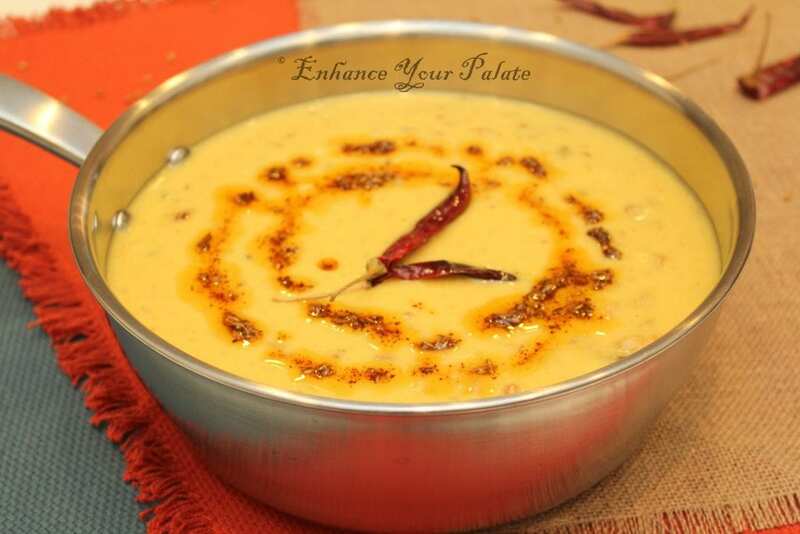 If you want to enhance it further, you can add tempering (tadka) from the top. Avoid to keep it low fat. Your Mangodi Papad Kadhi enhanced with green mango falvor is ready. 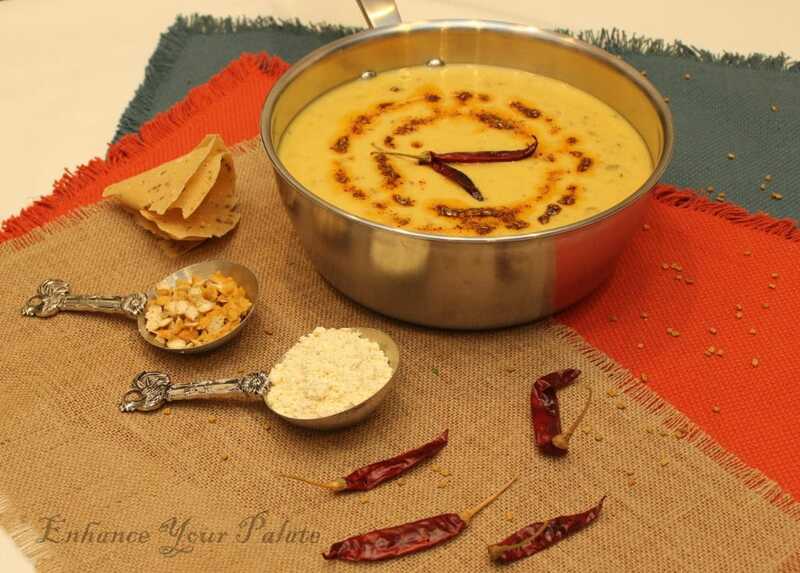 Serve as an accompaniment with some staple foods such as finger millet, rice or Indian flat breads. If you'd like, you can have it just as a soup as well.